Lavender has a symbolic meaning in my family. It was my Dad’s favorite color. At his request, it was a code word his wife and daughters used when he worried too much. The word lavender was a gentle reminder to Breathe, Calm the mind, and Be. During the final years of my Dad’s life, he lived in the Memory Center of a Sunrise Assisted Living facility. As the disease robbed my Dad of his faculties, touch, guided gentle movements of his limbs and lavender scent was how I communicated with him. In the middle of my Integrated Yoga Therapy Teacher Training program, I realized, my family had been incorporating yogic principles as we coached my Dad to stress less during his healthy years . Later, the gentle movements of communication, that connected us in his final years, in hindsight, seemed like gentle yoga movements. During my teacher training, I was stressed about whether I could be a teacher given my age and physical conditions. As I was re-introduced to yoga poses that my teenage body mastered, my older, heavier body was having difficulty with some “easy” poses. At one point, I realized my body and mind were easing into some of these poses after repeated practice over several days. Lavender Om Wellness popped into my mind and I knew that this was going to be the name of my yoga work going forward. In another yoga training program, I decided I wanted to visit lavender farms in the US. In memory of my Dad and for fun, I started to visit lavender farms and began to incorporate natural oils from local farms into some of my yoga classes. I began to study more about the healing properties of lavender. The more I learned, I realized it fit in well with aim of gentle and restorative practices. 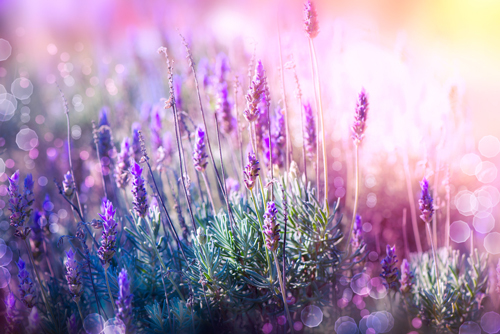 Recently I learned that some teaching hospitals are experimenting with lavender to calm Alzheimer’s and other patients.